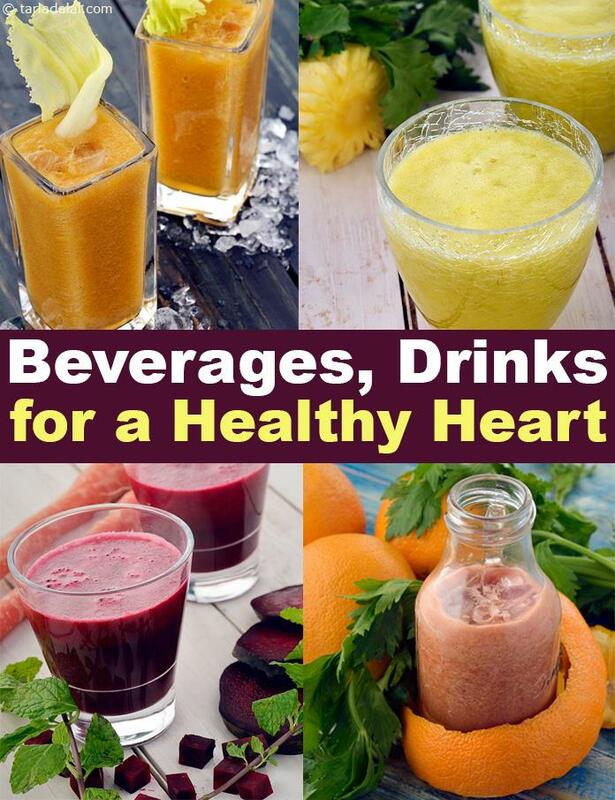 beverages for a healthy heart. When you feel like drinking something refreshing and healthy, check out these healthy drinks! Armed with these recipes, it is so much easier to avoid sugar-laden drinks and beverages, because these are so much more tasty, refreshing and heart-friendly too. This handy collection of low-cal and low fat beverages like juices, mocktails, shakes and smoothies are made with carefully-chosen ingredients, which are known to protect the heart from free radicals damage and keep it fit. Apple Cinnamon Soya Shake is a protein packed satiating fruity drink which is rich in anti-oxidants and flavonoids from soya and apples. It is also cholesterol free becase low-fat milk is used. Papaya and Apple Frappe should be had chilled to refresh yourself, a good source of beta carotene vitamin A and vitamin C with natural sweetener – honey. Try making a low fat and cholesterol free drink like Strawberry Honey Smoothie which has a nice baby pink colour that is liked by almost everyone. Get yourself loaded with energy with this Instant Energizer, a drink made using Carrot, Apple and Orange which is super rich in antioxidants like Beta carotene and Vitamin C . Beet Treat, as the name suggests it has beetroot but carrot and apples too have been used to add nutritive value to it. Carrot and Black Grape Juice is loaded with antioxidants like Vitamin A and resveratrol that are really good for eyes and high blood pressure. Chaas is loved in all parts of India. Try the low fat chaas recipe which is made from low fat curds and has zro oil. Perfect for a healthy heart. Enjoy our healthy heart drink recipes and other healthy heart recipes articles below. Kiwi pear smoothie as the name suggests, this smoothie is made from kiwifruit and pear with the combination of honey and banana which is energy booster and also full of vitamin c and healthy too.